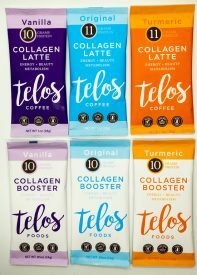 November 27, 2018 – Boulder, CO – Telos Foods debuts with their first two lines; Collagen Coffee Lattes and Collagen Boosters, available direct online and with Amazon. These products are macronutrient blends of Non-GMO high quality protein, healthy fats, and adaptogenic herbs designed to enhance the nutrition of beverages, smoothies, hot cereals, soups, and even baked goods. Telos was created by Founder Penny Sparks who is a practicing holistic nutritionist based in Boulder, CO with over 30 years of experience and education in the world of natural health and healing.